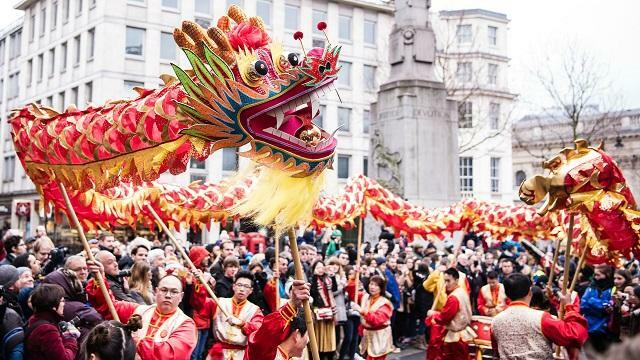 Watch colourful floats and more than 30 teams take part in the vibrant Chinese New Year parade, which kicks off at 10am with a dragon and lion dance in Charing Cross Road, before snaking its way through Chinatown. Walk down to Trafalgar Square from 12pm for the main stage performances, featuring traditional Chinese dance and music shows, contemporary hip-hop acts and an exciting line-up of artists from China. Get a taste of the Far East at one of the two food zones: tuck into street food in Trafalgar Square, or sit down for a traditional Chinese New Year menu and special festive treats in a Chinatown restaurant. Take the kids to the Leicester Square family zone for cultural activities and family-friendly performances, including calligraphy, Chinese music, dressing up in traditional outfits and more. Avenue martial arts and culture zone. Spot up-and-coming British-Chinese artists on the New Talent stage, hosted by Spectrum Chinese radio, in the Charing Cross Road community zone. Enjoy more cultural activities with lion dances and craft stalls in Chinatown. Don't miss the pyrotechnic display which lights up Trafalgar Square to mark the end of the festivities. See thrilling martial art performances, including tai chi chuan and traditional flag display, in the Shaftesbury Avenue martial arts and culture zone. Every year, hundreds of thousands of people descend on the West End to enjoy a colourful parade, free stage performances and traditional Chinese food, and to wish each other "Xin Nian Kuai Le" (Happy New Year in Mandarin) or "San Nin Faai Lok" (in Cantonese).